My experience of the tragic news coming out of Japan since Friday has been different from most Americans. Not only did I spend a year of my life in Japan, but the place I called home during that time, the coastal village of Minami Sanriku in Miyagi Prefecture, was at ground zero when the earthquake and tsunami struck. It has been obliterated. Half its residents are still unaccounted for. I taught English there in 1992-93, when I was a couple of years out of college. Like many Americans who teach English in Japan, I had a job through the Japan Exchange and Teaching (JET) program, and was arbitrarily assigned to my little town. At that time, it was called Shizugawa; the name changed a few years ago, when Shizugawa merged with a neighboring town. Shizugawa High School, where I taught, is one of the few structures still standing in the area. You can see it perched on the hill in this aerial photo from the AP, taken a day or so after the tsunami hit. 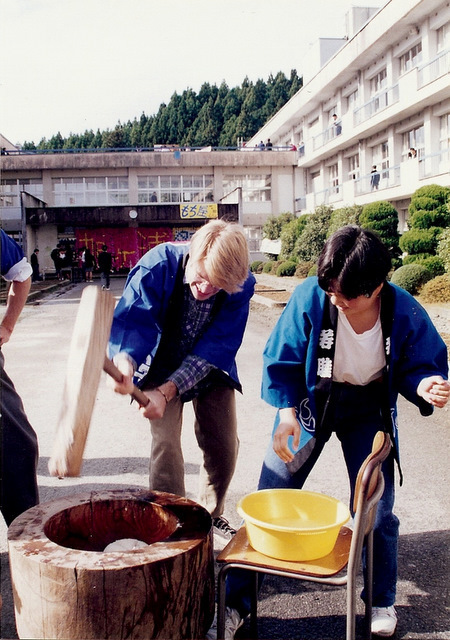 It’s also the building you see in the photo at left; that’s me with wooden mallet, pounding rice into mochi, the gaijin gamely re-enacting the Japanese tradition. I lived just down the hill, in a little house with tatami floors. The quaint downtown core of Shizugawa — it’s visible in the AP photo, underwater — was a short walk away, along a narrow canal that bisected rice paddies. I took that walk (or made that bike ride) nearly every day. And even after nearly two decades, many of my Shizugawa memories remain vivid: fishing from the town docks before sunrise, awkwardly singing karaoke with my colleagues, bravely devouring sea creatures with names no less strange in English translation than in Japanese (e.g. hoya, “sea pineapple,” a local specialty). That these places no longer exist, and that many of the people with whom I interacted, worked, and socialized are now dead, is nearly impossible for me to comprehend. At the same time, it is all too real. Most weekends I’d hop on a train to nearby Sendai, a city that reminded me of my home town of Portland, Oregon. Sendai was also ravaged by the earthquake and tsunami — though at least it will endure, in some form. The same may not be true of Minami Sanriku. Although I have no special insight into the matter, it seems very possible nothing like a town will ever exist there again. On the other hand, there are thousands of people who are still there now. Many are crammed into the high school itself, which has been set up as a temporary refuge. Others are still trapped in the rubble. Most of us here in the U.S. are powerless to help. But one thing we can do is offer much-needed financial support. I urge anyone reading this to join me in donating to the ongoing relief effort. As one whose life was changed by the generosity and hospitality of the citizens of Minami Sanriku, it is the least I can do. Thank you for this story. I too was a teacher in the same town for two years (94-95) and probably lived in the very same little house. I am working on fundraising here in Chicago–please do not hesitate to get in touch if you would like to coordinate. Hope you are weathering through this very tragic news. I feel like jumping on the next plane to go help out, so I can’t imagine how you feel, being that this disaster hits so much closer to home for you than it does me. I wish there was more we could do. Thanks for writing. It’s nice that people are finding the blog post. Did you teach at the high school or at the junior high? If the latter, I knew your predecessor Tony very well (he was in Shizugawa from 91 to 94). I really have been in shock for the last five days or so. It is tragic enough to think that many people I knew lost their lives; but to think the town simply doesn’t exist anymore is beyond all comprehension. Interested to hear how you’re going about fundraising. It’s not really my area, though I do a little PR and marketing for the company I work for. Thanks for writing. It’s nice that people are finding the blog post.